pretty.pretty.paper: my phone is off for you. 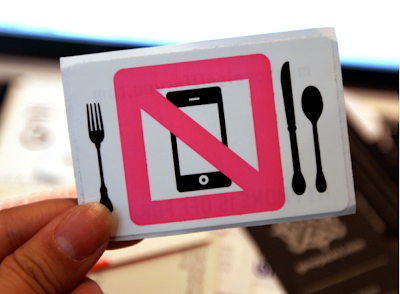 i have pretty strong feelings about cell phones at tables*. NOT ALLOWED**. i mean really people, is it that hard to either excuse yourself to take a call or just not answer it? the same goes for texts. i'm not too keen on sitting with someone while they are actively engaging someone else who is not physically in front of them. it drives me nuts and hurts my feelings (only a little). so when i came across this i fell in love, as in i want to order the five pieces of flair for everyone i know. plus how cute is that table setting? and the hot pink? ugh. perfect. 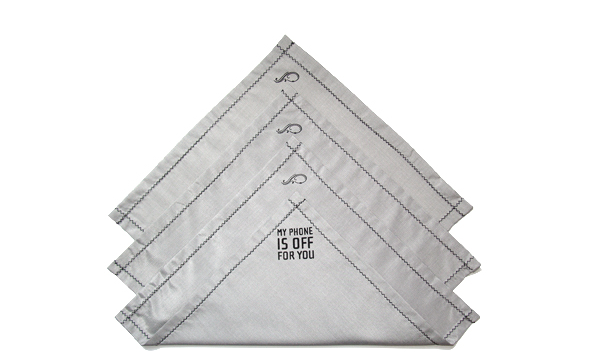 the hankies that block cell signal are kinda beyond wonderful too. *i come by this honestly. an immediate family member of mine travels with a cell phone jammer. i know horrifying. though he only uses it when he deems it absolutely necessary. **poor mas was subjected to my wrath last thursday at dinner ... he had a new phone, a new phone that didn't have a crack in the screen rendering the keyboard useless and causing him to not respond to two months worth of text messages. in his defense, he had started catching up with people before we went to dinner, but then we were sitting at our table and one message was sent, and then another ... that was the last. i totally agree with your setiments about cell phones at the table! Thanks for the post with the cute signs! I love this and totally agree!! It really bugs! haha that's a little pet peeve of mine too -- very fun & practical designs! i was at dinner with two friends and one of them missed the entire dinner and conversation because she was "text fighting" with her boyfriend the entire time. i was beyond annoyed. she didn't even stop when i gently reminded her of how rude she was being. omigod AMAZING. I need that hankie to carry around LA. Amen. I actually lost my cell phone last week and haven't found it yet, so I'm clearly on the way low end of the cell phone use curve. But I have gotten so annoyed about text distractions that D now frequently turns his phone off while we are in the house together. Nice to know that someone else can decide whether or not my sitter can reach me when I'm out to dinner. Hopefully he won't "deem it necessary" when my kid is in the emergency room. I kind of enjoyed catching up with mas. Sido, amen. Anon 5:42, thank you. CEVD, my phone is now off for you. I actually witnessed an entire family out for sushi on their phones the entire time. It was quite horrifying.